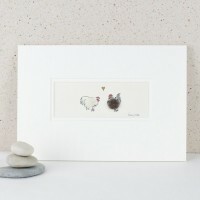 Browse through this section to see what other farm animals have made it on to Penny's unique style of art. 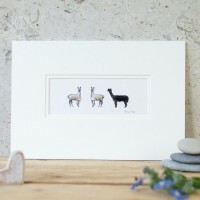 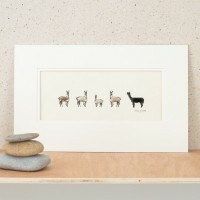 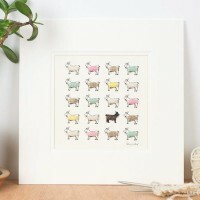 We have everything from colourful, fluffy goats printed on paper handmade from T shirt clippings in southern India and the charming John Deere Tractor and Pigs through to the amusing 3 Little Pigs picture, complete with fluffy bodies and hand finished with real sheep's wool and the Picture of 6 Highland Cows. 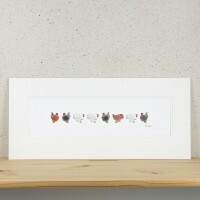 Our farm animal pictures are available as unframed, or framed in a choice of oak, black or white and make a splendid gift for anyone who enjoys the country side or country pursuits. 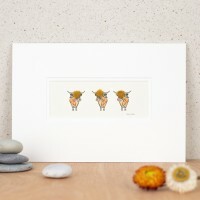 These items make ideal gifts for men for birthdays, father's day or just as a special thank you present. 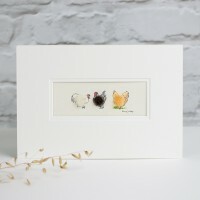 If this is a gift for someone, why not choose one of our greeting cards with a similar design to accompany the gift - this would really put an extra smile on their face. 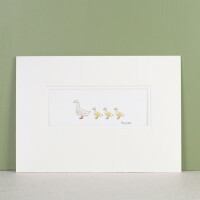 Our ducks and duckling print is a delightful gift for an animal lover. 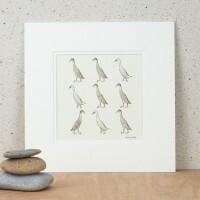 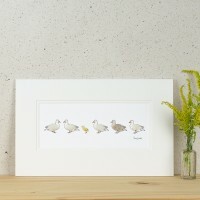 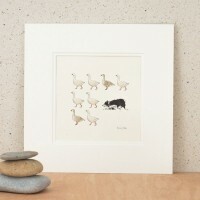 These are call ducks and ..
Our ducks picture, 9 fluffy Indian Runner ducks makes a gorgeous gift for a duck&nb..
Our geese and border collie print is a lovely quirky gift for a farm animal lover. 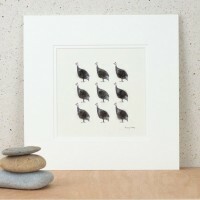 Border colli..
Our goats, hand finished print with fluffy Cashmere goats is perfect for a calm&..
Our guinea fowl picture, 9 fluffy guinea fowl makes a gorgeous gift for poultry keepers. 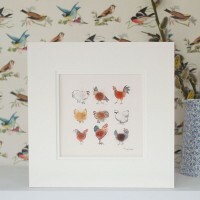 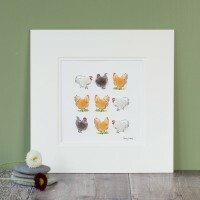 I..
Our hen print features a selection of all sort of different hens and chickens. 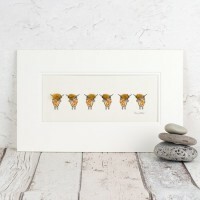 It makes a gorgeous g..
Our Highland cows in a row print has 6 cows each with a little fluffy topknot made u..
Our Highland cows print, 3 in a row, is an adorable gift for anyone who loves these magni.. 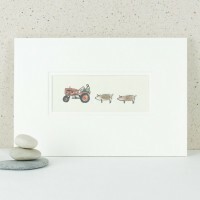 If you are looking for a quirky gift for a man, or a farmer, why not look closely at our pig bre..
Our pigs and John Deere tractor print is a perfect gift for farmers and pig lovers alik..
Our pigs and vintage tractor picture is an ideal gift for farmers, pig farmers and all pig lovers. 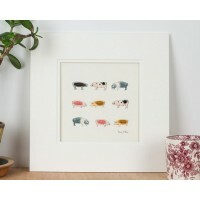 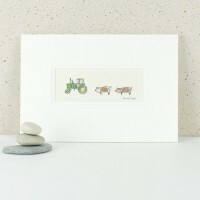 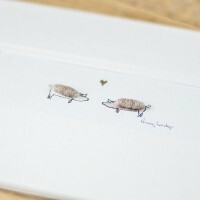 T..
Pigs print, Britain's ancient breeds, is a lovely gift for a pig lover or pig farmer. 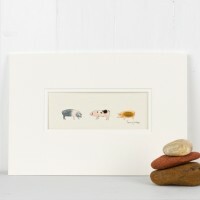 Maybe this i..
We've revised our pig print and love this new version. 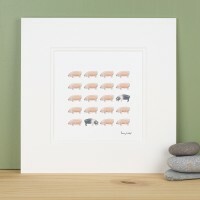 Our pigs print has 20 pigs now, with 18 ..